When I was a teenager I used to work at the electronics department at the local Sears store in my neighborhood mall. Now, before you start making fun of me, I’d like to say that I learned a lot about electronics and technology while working there. Back then, HDTVs had barely begun to surface and placed on the sales room floor. The latest video camera technology for camcorders used mini DV cassettes. The most advanced landline phones consisted of a 2.4 GHz frequency and a basic LCD interface controlled by handset buttons. Today, touch screen buttons seem to be the popular option for modifying settings on any device. This modern way of interacting with devices leaves little room diversity. After all, there’s only so many unique ways of touching a screen to select an option. This brings us to the current patent war between two big corporations. It is no surprise to anyone that Apple and Samsung are rivals. The duo have been involved in lawsuits in many different countries worldwide. Although the majority of courts have sided with Apple, the war is far from over. So who is copying whom? Check out the infographic we’ve included below. 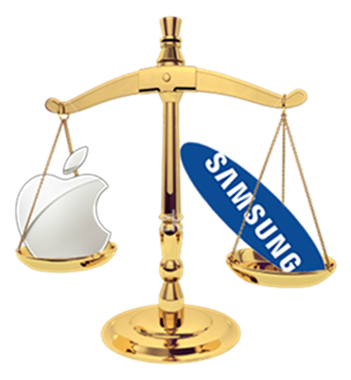 The folks at MBA have organized a chart to uncomplicate the complicated patent war between Apple and Samsung. Lawsuits are flying back and forth like a high-school cafeteria food fight. Yes, the war so far has been messy. Apple has been able to successfully block the Samsung Galaxy tablet from being sold in the Netherlands, Germany and Australia (at least for a while). Meanwhile, Samsung has been able to force Apple to hand over the iPhone 4S source code coding, which includes the current beta Siri technology. Long story short: Apple claims Samsung is blatantly copying their iPhone and iPad designs. Samsung, on the other hand, claims that Apple cannot claim copyrights and patents on certain basic functions for any device. On a side note, Apple submitted suggestions on how Samsung can make their own original devices. Ouch! The patent war between Apple and Samsung is far from over. Both companies are standing strongly to their grounds. Who will win the patent war after all is said and done? The fate of each company depends on the courts now.